Is it time for expert Ramsey asphalt rejuvenation services? Call (201) 327-5258 today so we can set up an appointment to provide a free estimate and get your asphalt surface looking great again. You can have access to online discounts and coupons when you click here now. Nothing remains the same forever, and that is especially true of asphalt. Made from a mix of aggregate (crushed rock, gravel, sand), binder and filler, asphalt is flexible and versatile, but it is also prone to damage from the elements and large volumes of traffic. Asphalt rejuvenation is a service that can give your asphalt surface a boost when it needs it most. Discover what your neighbors are saying about our services when you click here now. All asphalt surfaces require some work from time to time, and the rejuvenation process can restore some of the properties that have deteriorated since the asphalt was laid. Asphalt rejuvenation is great for faded asphalt that needs some aesthetic help, but doesn’t really have any serious damage or safety issues to worry about. It basically brings the asphalt back to life and helps it to look like it did originally. 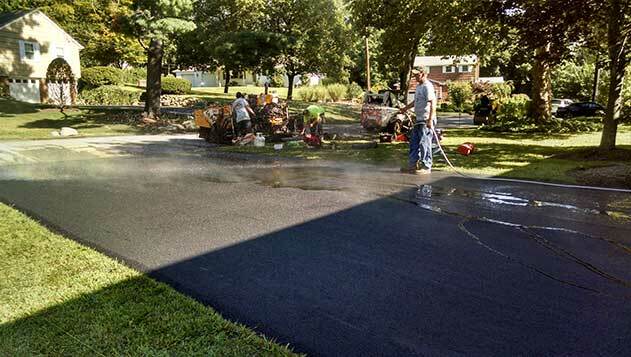 Asphalt rejuvenation is also great for preventing issues before they happen, or become worse. The service can slow down the asphalt aging process, prevent fuel damage from countless vehicles driving over it, prevent cracks in the surface of the asphalt and helps to restore its flexibility. Just like your health, a car, furnace or any other process, if you can prevent issues from happening, then you’re going to be better off in the future. Since asphalt is bound to break down due to its position in the elements 24 hours a day, then being able to slow down the aging cycle is a big benefit for most parking lot owners, property managers and those in charge of public roadways. Since asphalt rejuvenation deals with chemical elements, and you must take the current condition of the surface into consideration, it’s wise to use a reputable, professional contractor to perform the service. When you hire a professional for your asphalt rejuvenation, you will have peace of mind knowing that every detail has been addressed, and you’ll get the most out of your new surface as possible. Poor paving jobs are everywhere, so take the time to find a service provider that has the reputation, the skills and experience to get the job done right. Keeping your asphalt surfaces in pristine condition should be a top priority, so take action when you start seeing cracks and other types of damage. Call McFarlane Asphalt at (201) 327-5258 in the Ramsey, NJ area for professional and cost-effective asphalt rejuvenations service.